Good morning! I know I have been missing in action. Thought I'd let you know I hope to be back to blogging soon. My computer died shortly after Christmas and I have a new one now but it took time to load my files from Carbonite ( so glad for Carbonite backup) and reload some programs. Then we had modem problems. Our connections to get online and on our network failed. After 2 changes in modems, we are finally back to normal connections. My new PC is Windows OS 8 and I dreaded changing from my Vista OS but have found it was an easy transition. Not at all as difficult as I had read and heard. In fact I am liking some of the new apps available and find it easy to maneuver. In the meantime, we made a trip to Tennessee for my Mother's 94th birthday. Fortunately we had good weather for the trip down and made it home before the snow hit in Ohio. While in Tennessee, the weather was in the 40's and 50's but was very cold there on the morn we left. As I typed this, it is 2 degrees outside and we must have 5-7 inches of the white snuff. We are now preparing for our trip to Captiva Island for a few weeks. Looking forward to some sun, sand, and surf. I plan to try to get back to visiting in blogland very soon. See you there. Welcome! My card is for a sketch challenge and a few other ones too. I have again used scraps of cardstock including the white card base and followed the sketch from Seems a Little Sketchy. The Stamps are from Gina K Designs Buds and Vases (Flower) and Pressed Flowers (Thanks) some of my older sets. Used a fairly new EF from Darice Flower Frenzy and Spellbinders Lacey Circle die. Inks used were Memento Dandelion and Versamark . Used Wow EP in Sunshine Yellow....first time to use....forgot where I got it. Added Glitter Domes and used Clear Star Pen on stamped flower for Shine. The size of the card is 3.5" x 5.5".....just happened to have in my scraps from another project. 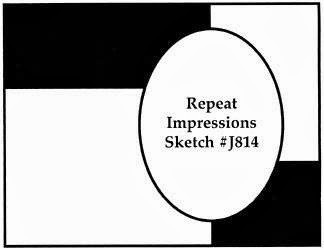 Crazy 4 Challenges: Make a skinny card 3.5" x 5.5"
Creative Card Crew: The challenge sketch is the same as SALS . My first time to play here. Happy Monday! 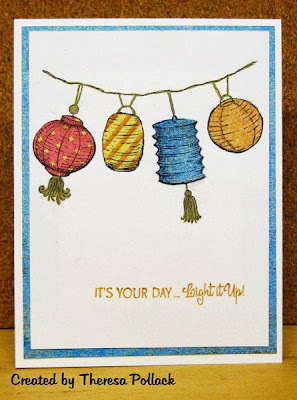 It has been awhile since I entered a challenge at Meljens Designs... this week the challenge is Bullseye.... to center everything on your card. I decided the use of a circle seemed appropriate for this challenge. I found this image Frosty Face in my files that I had printed sometime ago. I colored him with Copics N 2,4,7, B0000, G 19,82,85, R46,Y38, Y28 and a Clear Star Pen for sparkle. Using a GKD Green cardstock as the base, I layered with a Pebbles Pattern Paper and attached the image cut with a Nesties circle die and matted on a red circle. 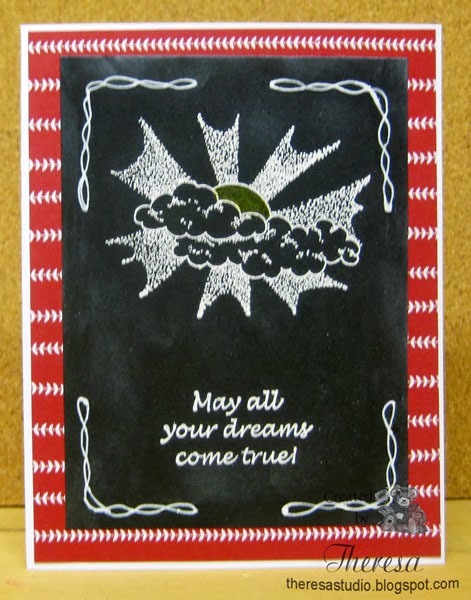 Finished with a sentiment from Creative Clear Stamp Holiday Sentiments embossed with white EP and embellished with red rhinestones. 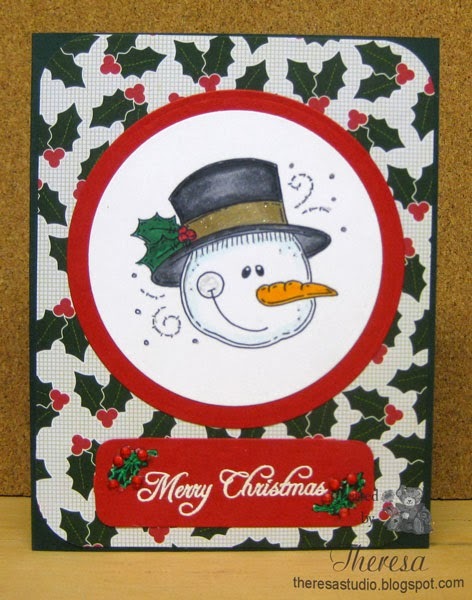 Craftyhazelnut's Christmas Challenge: Winter Weather....snowmen are certainly part of our winter weather. The making of this card supports my goal for 2014 to use up scraps and supplies that I have neglected. Used scraps, bling and preprinted digis just laying around for months. Hello and welcome! This is my second post today. 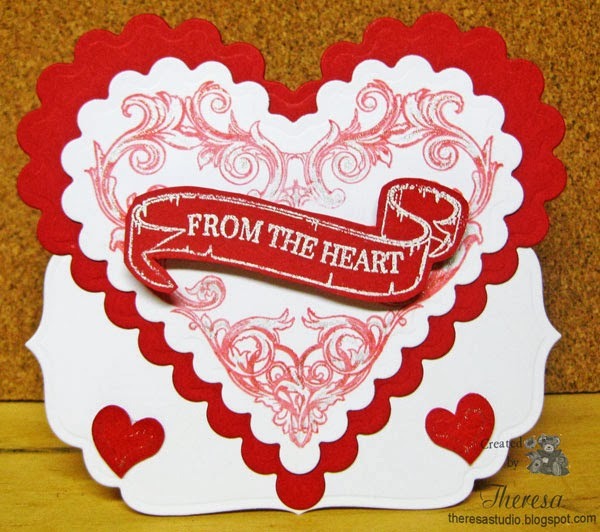 Today I have another fun card that I created from playing with Nesties Scalloped Hearts. The objective was to make a one layer card. I simply cut some stencils from 3 sizes of the hearts ...laid the stencils one at a time on white cardstock and sponged with Distress Ink Spun Sugar. This was a good exercise to practice sponging. To add some dimension I outlined part of each heart with a Memento Rose Bud marker. It almost appears that the hearts were cut from pink paper and attached...but not! I stamped the sentiments from Flourishes' From the Heart set in Rose Bud ink and added a narrow pink ribbon with scor-tape to finish. 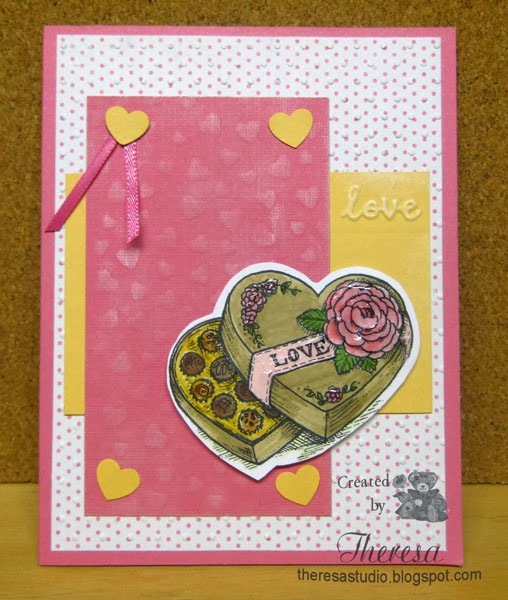 I am thinking of Valentine's Day which inspired this card made with a sketch from Sweet Sunday Challenge. I stamped the Candy Box from Flourishes Love Sweet Love set. I fussy cut and colored with Copics E27,44,55, RV 11,21,23,Y 28,G82 and Atyou Spica Gold. Added some glossy Accents to the flowers on box. I used Pink CS from stash for the card base and scraps for the layers. The Polka Dot Pattern is from MME. Embossing: Used Cuttlebug Swiss Dots on the pattern, Fiskars Texture Plate Hearts on the pink, and Cuttlebug EF With Love border on the gold. As an afterthought, I added the hearts and ribbon laying on my desk that were leftovers from other projects. The temperature is back in the 30's today. At least we had one day yesterday without freezing cold. What a change in the weather....almost 50 degrees! Almost Spring like....NOT! But it is much warmer than yesterday. The year has started off with some great challenges - some that I followed have closed but I am finding new ones through my blog friends. 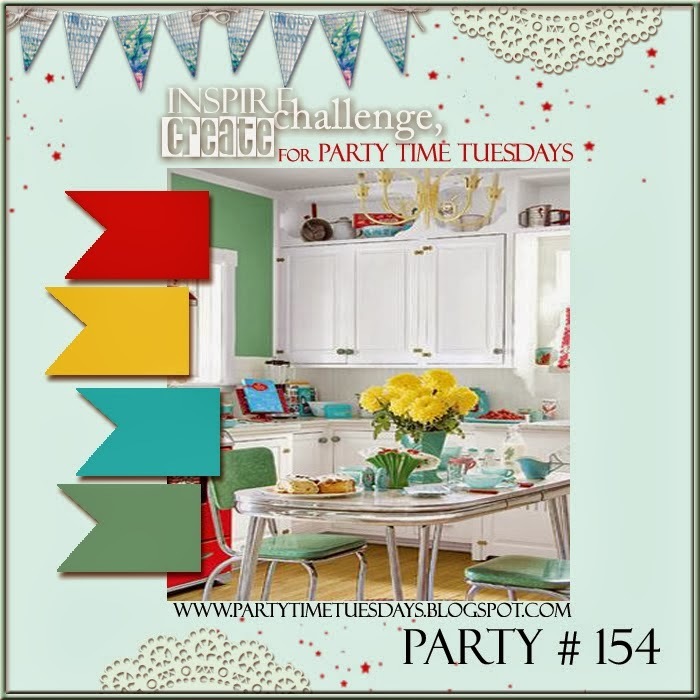 I found some pattern paper in some new supplies that I thought was great for the color challenge at Party Time Tuesday using red, yellow, blue, and green and combined that with a sketch challenge at The House That Stamps Built. The pattern paper is from a (new to me) pad from MME A Mother's Love. I used both sides of one of the papers and used white CS for the card base and the image. I stamped Tulip Bouquet from Repeat Impressions with Memento Tuxedo Black and colored with Copics R20,22,24,YG91,93, YR20,21,65 matching colors with the color challenge as well as the floral paper. The image was cut with Nesties Oval die and layered on a Blue Mat (a scrap) cut with Nesties scallop oval die. Following the sketch, I layered the pattern papers that I embossed with Cuttlebug EF Swiss Dots and Darice EF Flower Frenzy and attached the image. I added "Thanks" that I cut with my new Cameo in a Red CS. 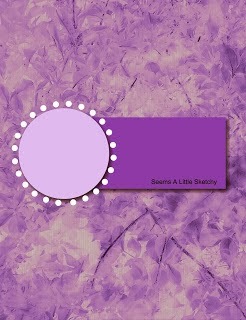 The challenge at Cheery Lynn Designs this week is Winter Whites and we must use at least one of her dies. I started out and cut a few of her snowflakes thinking I would make a card featuring snow and snowflakes. Then I took out a white glossy cardstock and thought I would use it for the card base. Playing around I decided to emboss the Cathedral Lace Frame die on the front of the glossy white CS cut to 7"X10". I have always cut with this die but never used for just embossing. 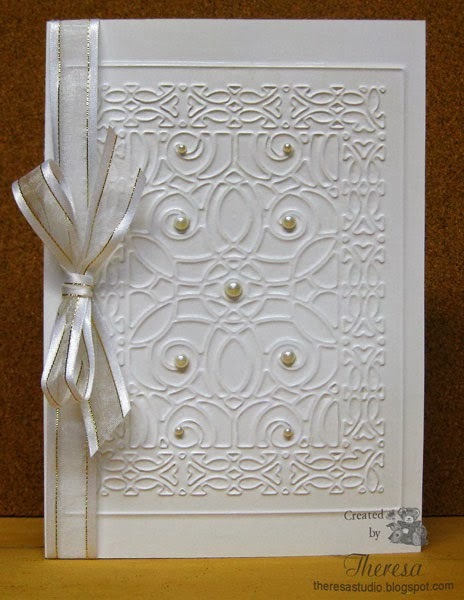 I loved the look of the embossing....such an elegant look on the glossy white .. so much that I decided this would be the feature of my card. Added some pearls and a white organza ribbon with gold thread. I finished the inside with a panel of white cardstock embossed with Swedish Spring Oval Frame. 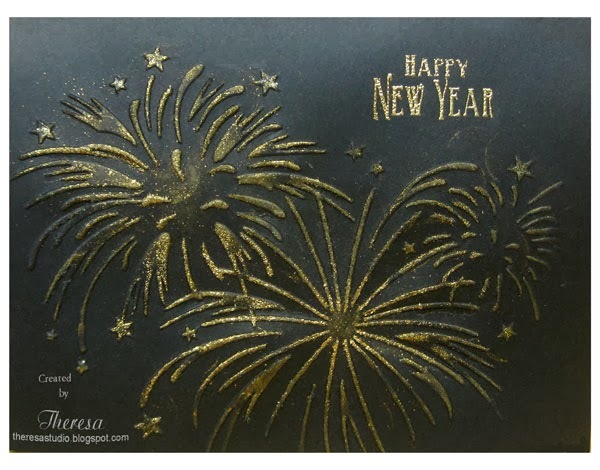 I heat embossed the sentiment from Flourishes with gold embossing powder. It is fun to experiment ....you never know what you might create. Hello! Are you keeping warm? 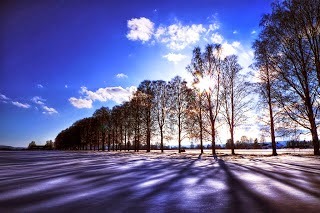 We had more snow here in Ohio last night but we are having a warming trend today....up to 36 degrees. 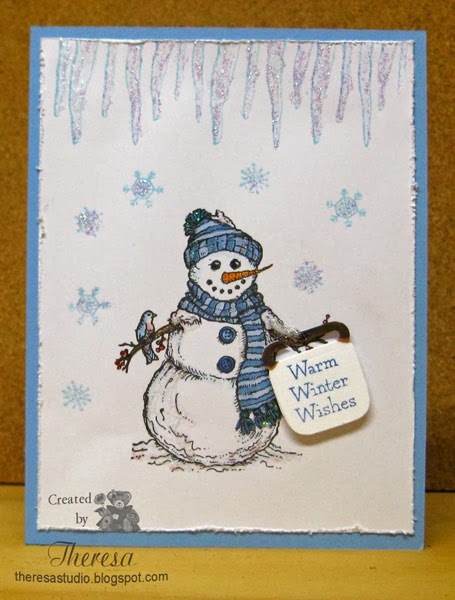 The cold weather inspired this card that is for some snow and ice challenges. I stamped Flourishes' Snowman with a Bird (made it a bluebird) with black ink. Colored the image in Copics and hung a sign on his stick arm sending Warm Wishes. Added some cold icicles and snowflakes for more coldness! Hello! The temp is beginning to warm up in Ohio. It has reached 12 degrees as I post this. 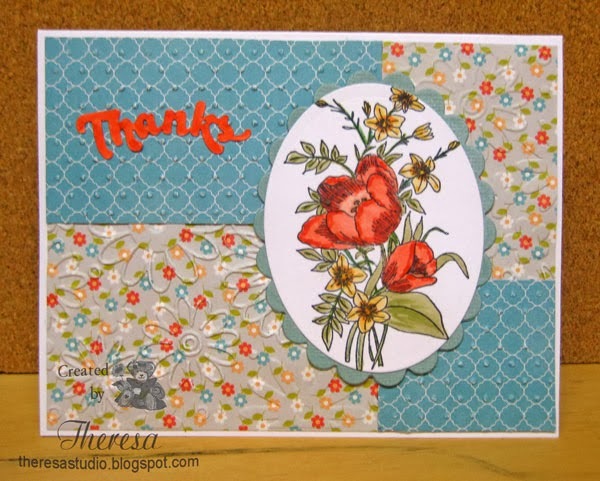 I made another card for Flourishes Timeless Tuesday challenge FTTC253 to make a Shaped Card. I just had to use flowers on this one since this month's Flourishes release is Flowers For Jan. I am also cutting the first stamp image that I cut with my NEW Cameo...oh, how simple is that! 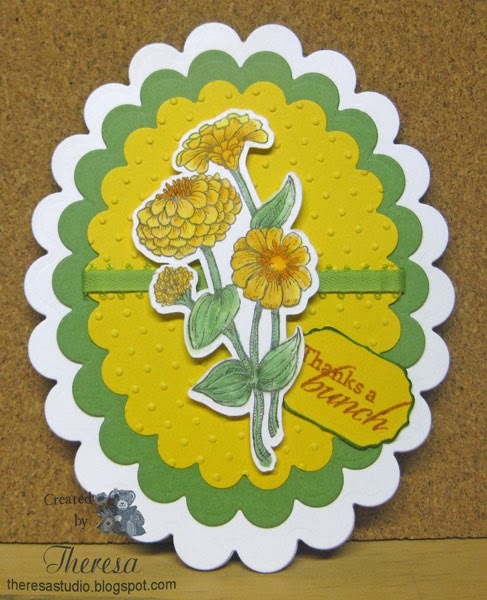 Using a cut file from Flourishes, I cut the outline of a stamp from Zinnias and then stamped the image directly on to the cutout. Hint: It is best to stamp the image before removing from the Cameo mat which holds the CS while stamping. I cut several and stamped at the same time. I colored the image with Copics Y02,17, 23, 38, G21, 40. 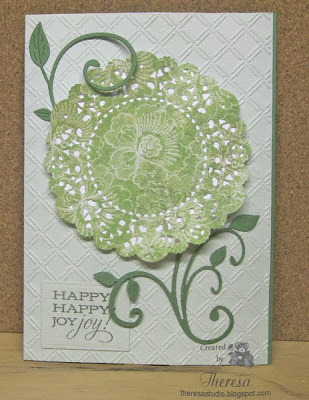 I created the card base with White CS and layers of Yellow and Green CS's all cut with Spellbinders Scallop Oval Dies. I added a green satin loop ribbon and a sentiment from Zinnias stamped in Memento Potter's Clay ink and cut with SB Label 4. 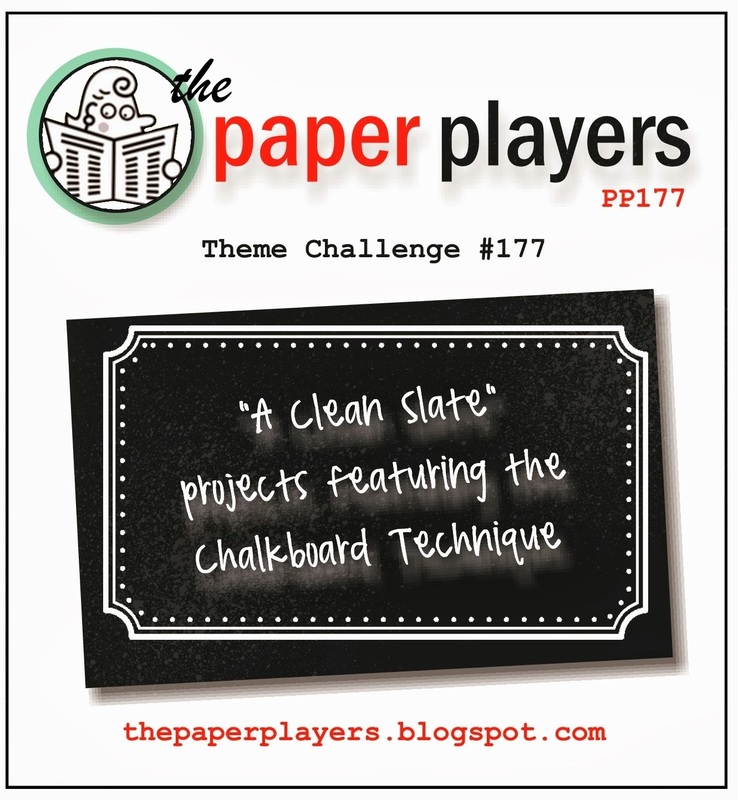 This is a new challenge that I read about on Patti J's Blog. Thanks for letting us know, Patti. 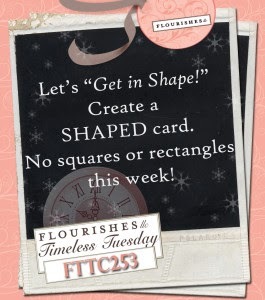 This week's challenge at Flourishes Timeless Tuesday is ushering in their new release. We are to "Get in Shape" by making a shaped card. 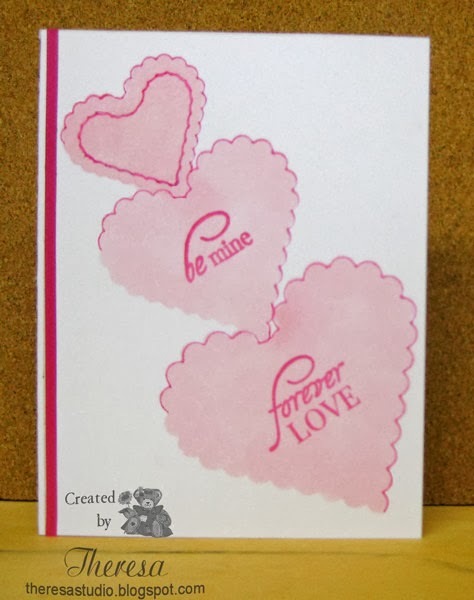 I decided to make a Valentine card combining scalloped heart die cuts and Label 4 die cuts made with Spellbinders dies. 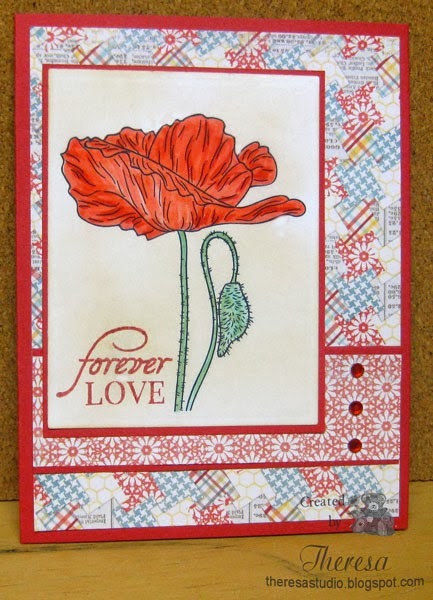 I stamped the white heart with an image from Flourishes From the Heart Set using Memento Lady Bug ink. 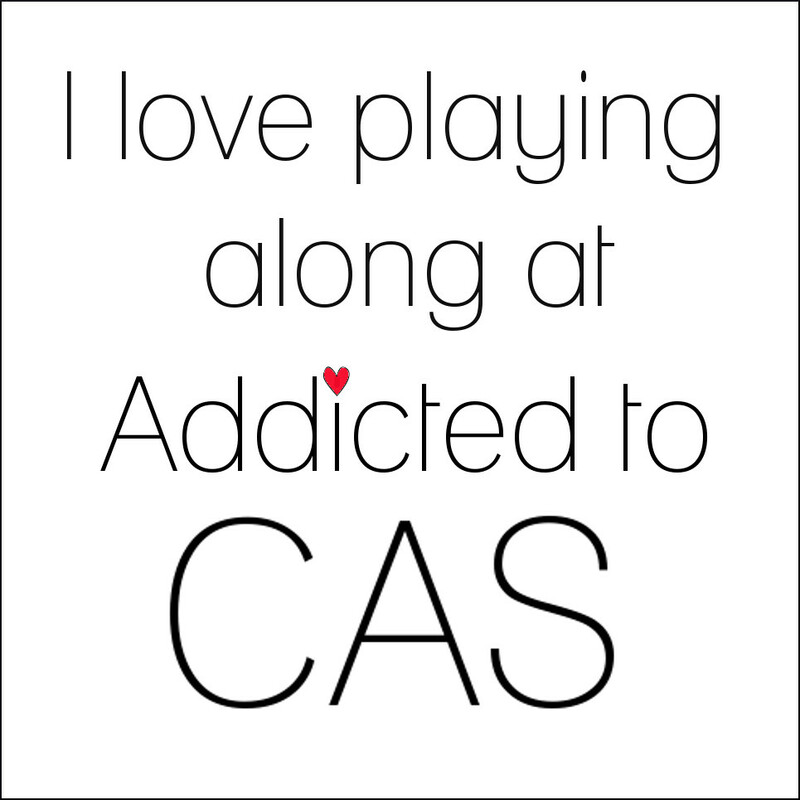 I attached this to the red heart and then to the card base of white CS cut with the Labels 4 Die. Using the same stamp set, I stamped a banner and sentiment with Versamark and heat embossed with white EP. I fussy cut the banner and popped up with foam dots and added 2 red hearts leftover from another project. Also added some sparkle with Clear star Pen. Hello! I should be house cleaning or packing away Christmas Decorations but decided to do a second post. I am still using some new supplies with one of my fave digis from Doodle Pantry. I also found a challenge that is new to me Digi Sketch Challenge. I made this card using the Digi Sketch shown below with the Poppy Digi from Doodle Pantry and new pattern Papers from MME 6X6 paper pad. After printing the flower, I colored with Copics R20,22,24 and BG11, G21 and then sponged the image with Distress Ink Antique Linen to darken the white CS. I used Red Cs for the card base and mats. 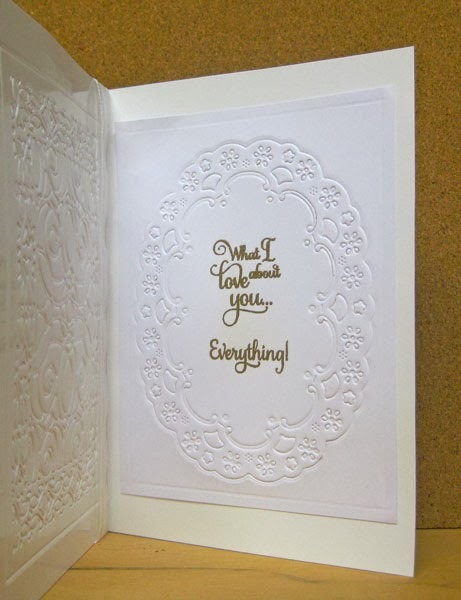 The sentiment is from Flourishes From the Heart set and stamped with Memento Rhubarb Stalk ink. Finished with rhinestones. 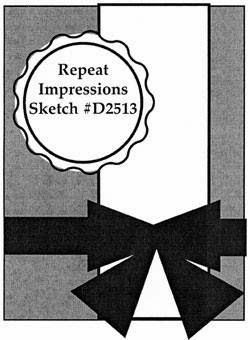 Doodle Pantry Monthly Challenge: DPDC42 use any digi. Used Poppy. 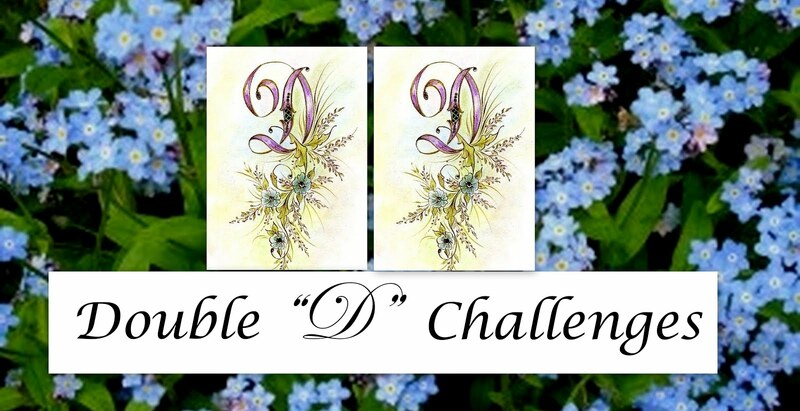 Digi Sketch Challenge: Theme is say it with flowers. Used their Sketch below. Simon Says: Something New. Used new papers. Scrap Creations: Something New. Been awhile since I entered this challenge. Welcome! I hope you are warm and cozy today. This is one cold winter in Ohio!! 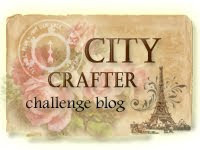 There are several challenges in blog land for Something New, meaning use new techniques or supplies, etc. I have this Repeat Impression stamp of a sunrise which I have never used.....thought it was appropriate since every day brings a new sunrise and a new beginning. I decided to put it to use using a technique new to me...the Chalkboard Technique. I stamped the image and sentiment (also Repeat Impressions) with versamark ink on Black Cardstock and heat embossed with White EP. I then sponged on some Brilliance Moonlight ink to give more of the chalkboard look. I colored in the sun with a yellow pencil and added some doodling with a Sukura White Gelly Roll pen . I am not sure if the doodling really adds anything but gave it a try for the first time. My DH selected the pattern paper since I had a hard time choosing one. Finished the card with White Card Base and the pattern paper from a Pebbles Paper pad which is also new. 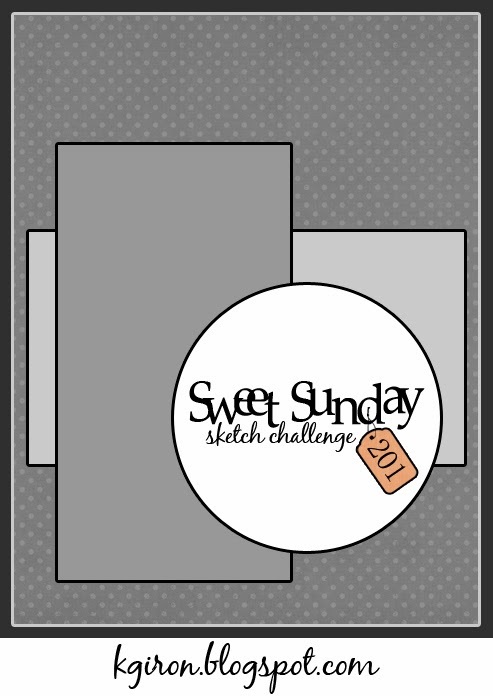 The House That Stamps Built: Designer Choice Challenge 11-New to you. Used new technique, new paper. 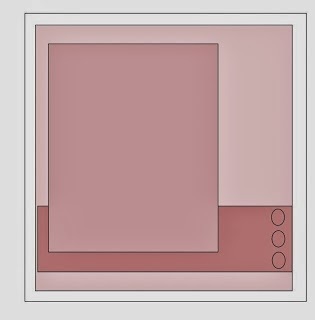 You can find a lot about how to do the Chalkboard technique online. I do not endorse products but the Sukura White Gelly roll Pen is great for writing on dark cardstock and I tried a lot of white pens before finding this one. Shopping our Stash: Use the last of something....last of the blue pattern paper. Tuesday Morning Sketch: Anything Goes....whatever we want to do. No sketch to follow this challenge. 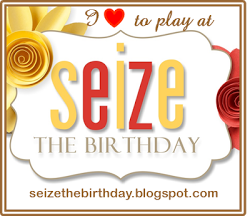 Charisma Cardz: Birthdays is theme. Happy 5th Birthday Charisma! I hope everyone in the cold zones will be safe and warm during all the record breaking cold weather. Today is another cold and snowy day...perfect for crafting. I made this card for the What If? Wednesday sketch challenge at The House That Stamps Built. I used a Bear Repeat Impressions Stamp for my focus image, I stamped the Cute Bear with Memento Rich Cocoa and colored with Copics E35,37, and 51. After cutting with a Nesties circle die, I sponged the edge with distress ink and attached it to a beaded circle die cut of red cardstock. I used GKD Brown cardstock for the card base and layered with a strip of Polka Dot Pattern Paper. I finished with a red wired ribbon tied in a bow. The ribbon was saved from a Christmas gift. My day was starting fine until my computer died....would not turn on after suddenly shutting down. My DH took it in to the Geek Squad who pronounced it DOA from a fried Motherboard probably due to old age. I am so glad that I have Carbonite that saves all my file. Now I am shopping for a new computer. 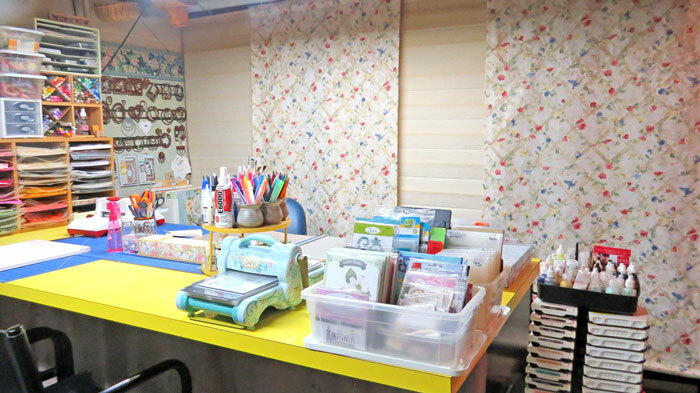 I am always looking for a new way to use supplies and I decided to use a doily die as a single large flower using pattern paper for my design. Because of the size of the "flower" I made the card size 5" by 7". Looked too crowded on a smaller size. The die is Cheery Lynn's French Pastry Doily and I also used her Fanciful Flourish die, my very favorite die. The card base is Bazzill light green textured cardstock, pattern paper is a scrap of K&Co, and dark green is GKD CS. Used Cuttlebug EF Windowpane and Flourishes stamp with SU ink. 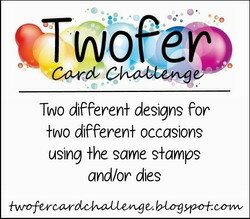 Cheery Lynn Designs is giving away an Ebosser (winner pays shipping). Why don't you try to win an Ebosser? Check it out here. Sounds like fun! Back today with more wishes for a Happy New Year. We spent a quiet night at home on New Year's Eve with a great dinner and champagne. On New Year's I prepared a brunch of Eggs Benedict topped with a bit of leftover caviar and Al served Mimosas. We had our traditional dinner of roast pork, black eyed peas, sauerkraut, and corn bread. It's partly a southern thing. 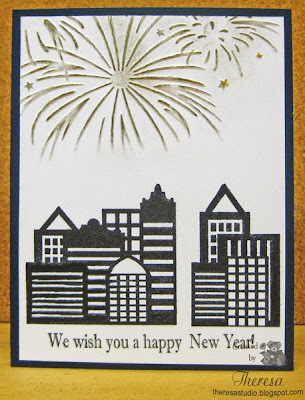 My card is made with stamps from Mark's Finest Papers "Big City" and "Peaceful Nuthatch" using Memento Tuxedo Black ink. 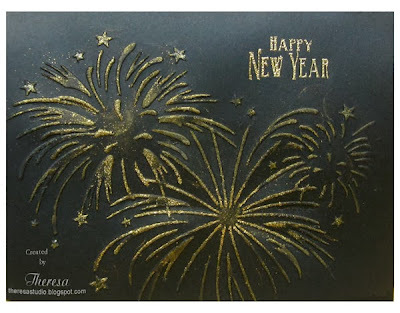 The fireworks are embossed with Darice EF and inked with gold ink and clearstar pen. Attached to a black cardstock base. Enjoy your day! Looks like more snow coming...great crafting weather. 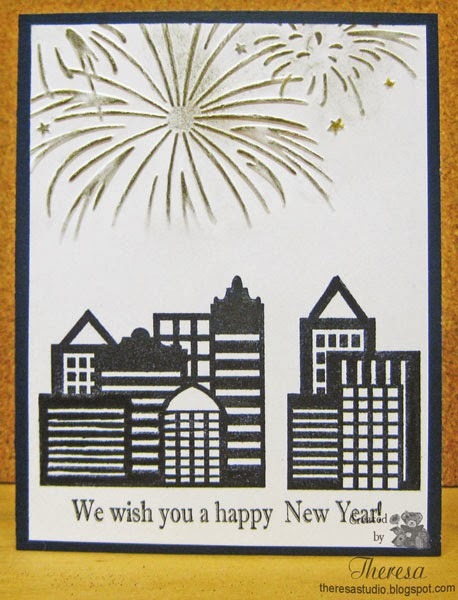 I am a bit late wishing everyone a Happy New Year but I wanted to post this card with my wishes for everyone to have a Happy and Healthy New Year in 2014. 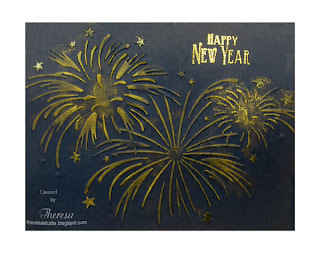 I made this card using a new Darice Embossing Folder called Fireworks. After embossing a Black Card stock, I inked the raised area with a gold ink and added some gold EP. I stamped the sentiment from Mark's Finest Papers (Peaceful Nuthatch set) withVersamark and heat embossed with Gold EP. This was a very easy card that I made in a matter of minutes...less than 10 minutes. I also made the same card using a dark navy cardstock but like it best in the black which is much more dramatic. Simon Says: Something New...using new embosssing folder.